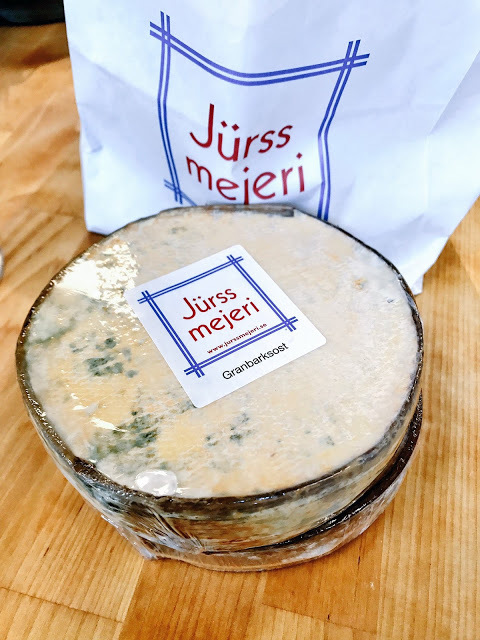 One of the treats in store for guests of next week’s Swedish Midsummer Supper Club is the bark cheese granbarksost from Jurss Mejeri dairy. Chef Linn Soderstrom and I drove to visit them, a couple of hours west from Stockholm. 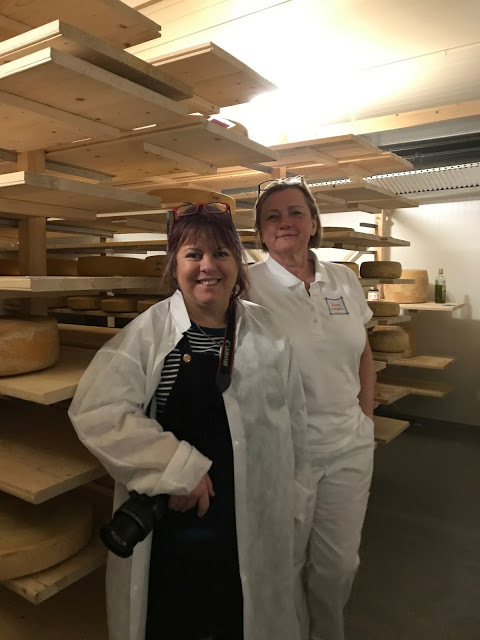 I met Kerstin Jurss the cheesemaker and her husband Claes. Kerstin is pronounced ‘Sherstin’ in Swedish. Whenever I visit Sweden, people gabble away to me in Swedish if they see my name, assuming I am Swedish too. 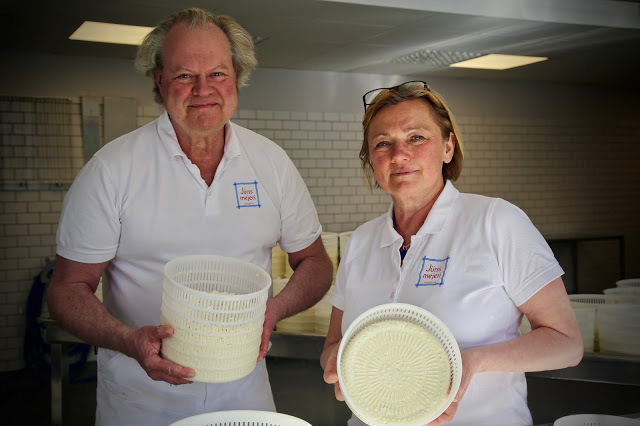 Kerstin and Claes started in a dairy in Jamtland, in North West Sweden, both making and teaching others how to make artisanal cheese. Last year they moved to Hälleforsnäs, a couple of hours west of Stockholm. 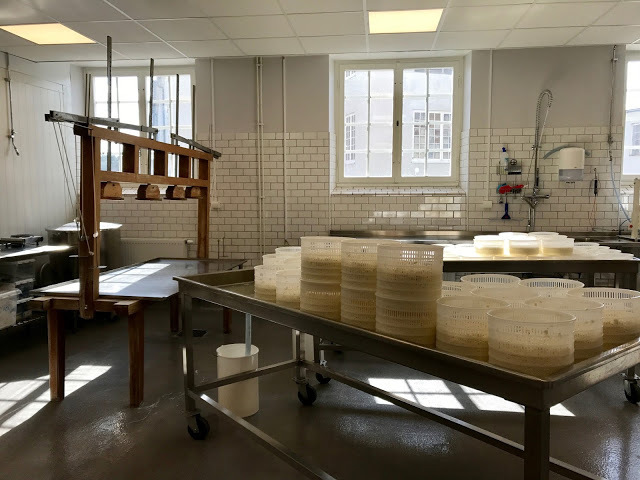 Cheesemaking in Scandinavia is reverting back to the pre-war situation of multiple regional and family farm cheeses. In the 1950s, Swedish food was influenced by the large scale Agribusiness model from the States. Arla, the multi-national, bought up all the small dairies. ‘We bought that attitude. We thought that was the shits’ explained Kerstin ruefully. Industries that had been going for centuries was taken over and turned into conglomerates. Do you have your own cows? ‘In Southern Sweden we have cows. In the North it is goats. Very few sheep. We buy from organic local farmers and from Arla. The milk comes unmixed from three possible farms but we always know which one it is. So we have traceability. Kerstin gives Linn and I a tour around the dairy. It is scrupulously clean. You could eat your dinner from the floor. We wear shoe covers as we are wearing street shoes. We are asked to don lab coats and hair coverings. 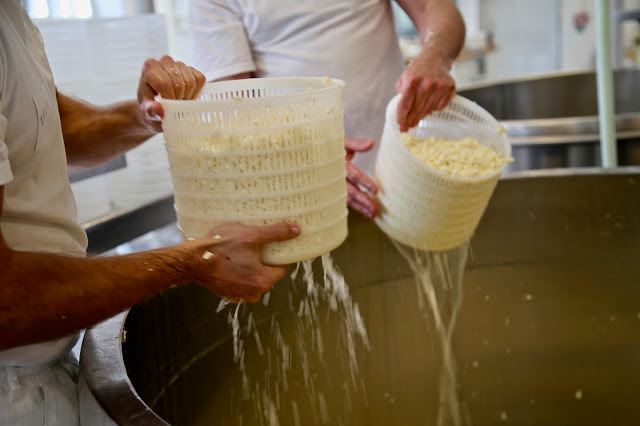 What is your favourite part of the cheese making process? You are still thrilled by that? The characteristic cheese of Sweden, I suggest, is quite mild, Edam-like, in slices. Vasterbotten did a big campaign. 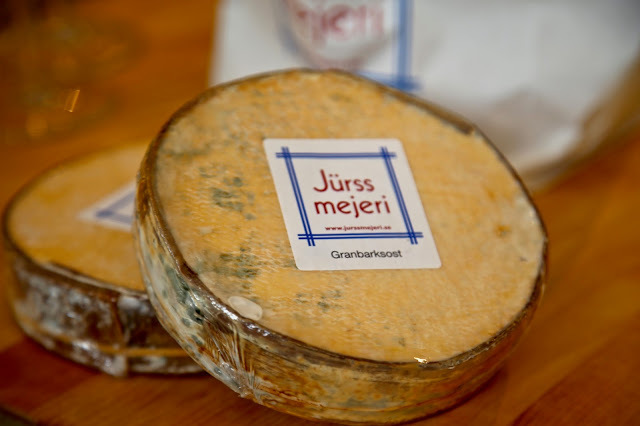 It’s an amazing cheese, the most northerly in the world, near the Arctic circle, I say. In Sweden do you eat a lot of cheese? I ask. 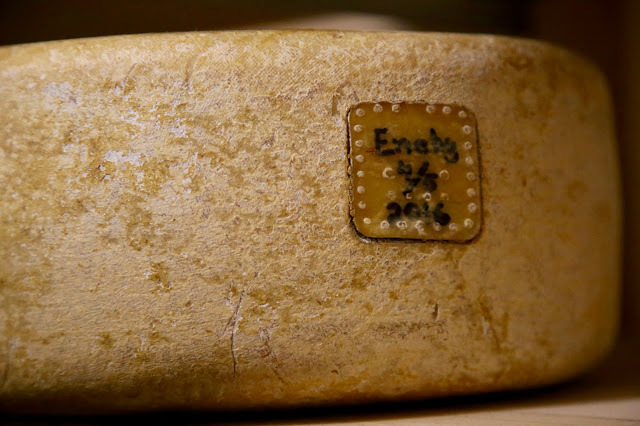 Swedes eat cheese for breakfast: eating on average 19.8 kilos a year. Here in the UK we only eat 11.6 kilos a year compared to France’s whopping 25.9 kilos. We enter a selection storage rooms, all fairly cold in temperature. 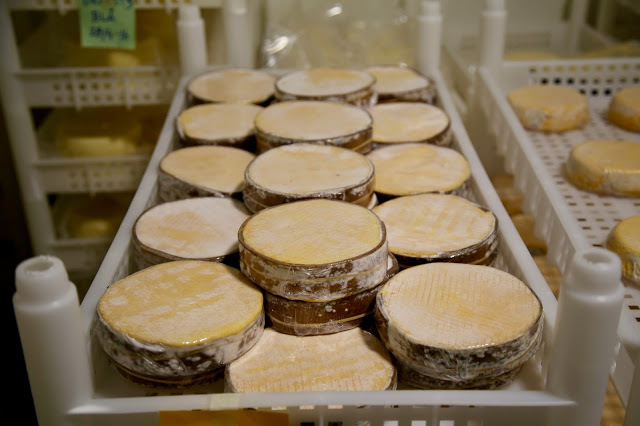 Different kinds of cheese are stored in different rooms, to prevent bacteria crossing over from one cheese to another. The yellow, magnolia and white disks roost on wooden shelves. 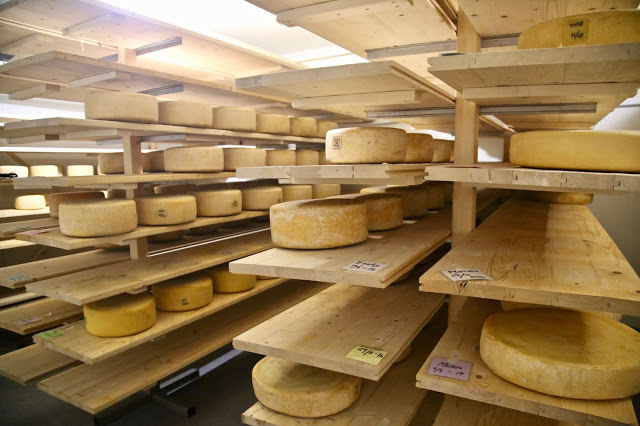 In another storeroom we see large cheeses covered in blue wax. Very Swedish, yellow and blue. There are good moulds and bad moulds. How can you tell the difference between mould and blue mould? ‘It’s not the mould itself. It’s whether the mould produces toxins or not. Bad moulds produce toxins, mainly only on carbohydrates. Bread and jam for instance has bad mould. Cheese is fat and protein. In milk you have sugar, that sugar is consumed by lactic acid bacteria, they consume the lactosis, they eat sugar and reject acid. So you have a transformation from sugar to acid. In cheese you can find very small amounts of sugar. In the old days people cut off the mouldy bit. I interject. That’s good to know, because cheese is expensive and you don’t want to waste it. We move to a room with a salt water bath. In another room we see a large stainless steel tank. Why have you made this bark cheese? What kind of bark are you using? You’ve got a lot of spruce trees around here? ‘We do but we buy this bark from a French company. We spoke to a Swedish forest company here, but when they realised how much work it was to prepare it, you cut it into pieces, and dry it, they backed off. You prepare the bark by boiling it so it’s soft. If you start from the middle and go out, you can taste the bark. Spruce flavour is a little bit like pine? We associate pine with floor cleaner. 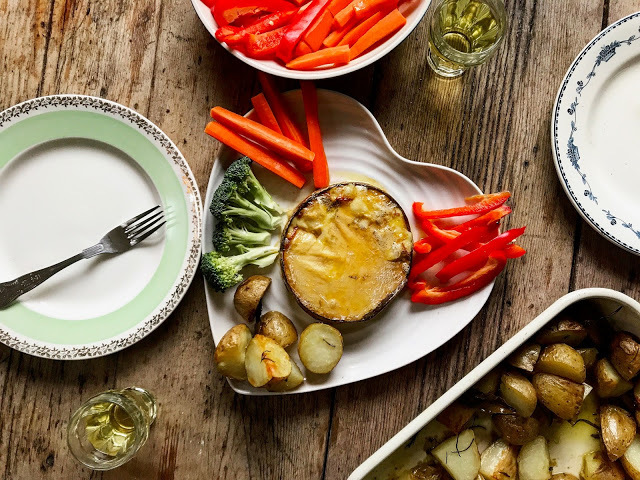 Later, on my return to the UK, I prepare it as a meal, dipping raw vegetables in the gooey cheese. It’s delicious. Book for the Swedish Midsummer Supper Club on June 21st. 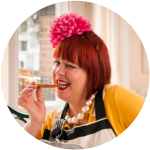 An Anglo-Swedish collaboration between MsMarmitelover and Linn Soderstrom with the participation of Chef Marion Ringborg of Spring restaurant. Tickets: £50 for a midsummer smorgasbord including herring, home cured gravadlax, aquavit, Scandinavian cheeses, skagen, salmon cheese cake, strawberry icecream and cake and other goodies. Look: flower crowns, viking, sheild maiden. I really enjoyed this article, such an interesting topic. I do eat cheese and yogurt made from animal milk, but would happily consume vegan versions. It has always fascinated me how many different textures and flavors can be created with such similar ingredients. Enjoy your midsummer feast!